Tournaments aren’t particularly good at producing ties. Generally speaking, there’s the champion and there’s everyone else. When it comes to the battle of the brands, however, the results aren’t always as clear cut. Consider Nike versus Adidas at this year’s FIFA World Cup in Russia. Some look to the number of team sponsorships to find a winner. Others consider jersey sales a better gauge. Still others focus on the popularity of each brand’s ad campaign. The latest data from YouGov BrandIndex provides yet another way that touches on all the aforementioned metrics: consumer sentiment. In this sense, YouGov figures suggest that Adidas and Nike are both scoring points. 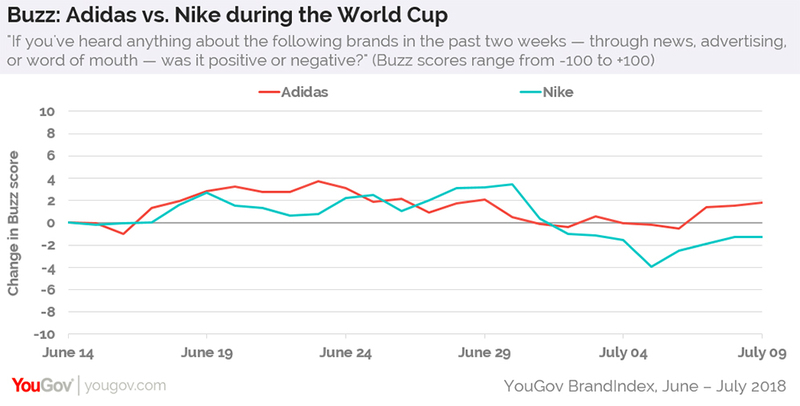 For YouGov’s Buzz score, which asks respondents if they’ve heard something positive or negative about a specific brand in the past two weeks, Adidas has seen slightly more positive gains since the World Cup began on June 14. While the tournament still has a few days to go, present numbers reveal a three-point gap in Buzz score gains between the two sportswear companies. Likewise, YouGov’s Word of Mouth metric — which measures how many US adults are talking about a particular brand — puts Adidas just a bit ahead of Nike in terms of overall gain. Since the World Cup debuted, the general public increasingly discussed both brands at a similar rate. Near the end of June, however, mentions of Nike among US adults appear to have decreased more than they did for Adidas. 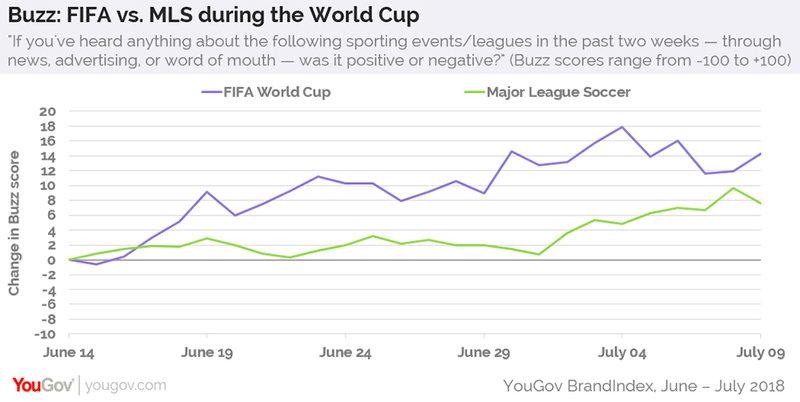 As for the World Cup itself, YouGov data finds that the event’s Buzz score has experienced notable gains since the tournament began. On July 4, for example, the day after Sweden beat Switzerland and England defeated Colombia, the World Cup had an 18-point increase in Buzz. Major League Soccer also appears to have benefited from the international sporting event. On July 8, MLS’s Buzz score had risen 10 points since the World Cup began.